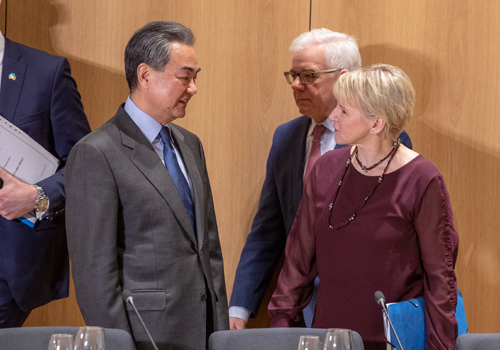 On March 18, 2019 local time, State Councilor and Foreign Minister Wang Yi held upon invitation a collective dialogue with foreign ministers of the 28 European Union (EU) member states in Brussels. Wang Yi expressed that it is the first time for the Chinese foreign minister and foreign ministers of various EU member states to hold a collective dialogue since the establishment of China-EU diplomatic relations 44 years ago, which is a sign of increased mutual trust between the two sides and will send out a clear signal to the world that China and the EU will strengthen their strategic cooperation. Wang Yi pointed out that President Xi Jinping is about to visit three European countries, which fully shows that the great importance the Chinese side attaches to Europe. We have noticed that China-EU relations are becoming more stable, mutually beneficial and strategic, and the two sides share more common interests, a bigger common ground and more common goals. Although both sides have differences on some specific issues, cooperation has always been the mainstay of the China-EU relations. Against the changes in the current international situation, China and the EU should continue to strengthen the comprehensive strategic partnership, enhance strategic communication and dialogue, properly handle differences, demonstrate solidarity and mutual trust, and promote mutual benefit and win-win results. This is a shared responsibility for both sides. Wang Yi stressed that the Chinese side firmly supports the European integration process, firmly supports the EU in staying united and becoming stronger, and firmly supports Europe in playing a more important role in international affairs. These "three supports" are based on the Chinese side's strategic grasp of and long-term consideration for the evolution of the international situation. They are not an expedient measure, not targeted at any third party, nor will they be affected by any momentary incidents that happen during the China-EU exchanges. We hope to see a multi-polar world and democratic international relations, and hope various countries will join hands to facilitate more beneficial, inclusive and win-win globalization. 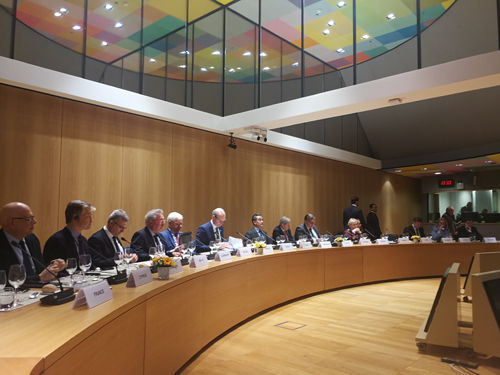 During the dialogue, Wang Yi briefed the foreign ministers of the EU member states on the latest development and the stance of the Chinese side regarding the joint construction of the Belt and Road Initiative, the 16+1 cooperation between China and Central and Eastern European countries, China's development prospects and the cause of human rights protection, as well as the Venezuelan and Afghan issues. The foreign ministers spoke enthusiastically and the two sides interacted actively, which enhanced mutual understanding. The foreign ministers of the EU member states praised the dialogue for being constructive and effective and fully affirmed the ten-point consensus between China and the EU. Highlighting the importance of the EU-China strategic partnership and the close attention they paid to China's rapid development and reform process, the foreign ministers expressed their willingness to work with the Chinese side to cement strategic coordination and jointly cope with global challenges, so as to maintain multilateralism and promote world stability and development.